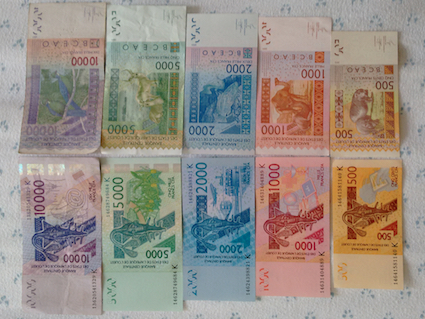 The CFA is the common currency of eight countries in West Africa. (People call the money “say-fah.”) CFA banknotes are gorgeous. The image doesn’t capture the subtle overlay of shimmer on parts of the bills, but trust me when I say they are truly stunning. If this particular combination weren’t worth about US$62, I would glue them to a board and frame them.